"Objectif pôle Nord" was the name of an ambitious polar project dreamed up by Frédéric Chamart-Boudet, a signaller in the French Navy. The project was scheduled to take place in two phases, with the first part in 2004 and the second during the following Arctic season. 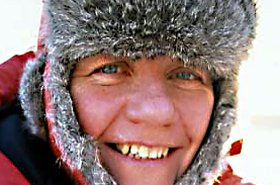 On 5th March 2004, Chamart-Boudet set out from Cape Arktichevski on his solo unassisted trek from Siberia to the North Pole. In that particular year, one detail had captured the interest of the purists: of the five expeditions setting out, three had been set down on the ice 15 kilometres from land because of a huge polynya stretching out to sea from off the Siberian cape and hence preventing all access to firm ice. Chamart-Boudet had opted to set out from the coast. The Franco-Finnish explorer Dominick Arduin did the same, only to disappear forever a few days later. A number of days after his departure, Frédéric fell into the water and took four minutes to clamber out of the ocean. In bad condition, he was quickly rescued by a Russian helicopter. The following year was scheduled to be phase two of Chamart-Boudet's project: a solo unassisted total crossing of the Arctic Ocean. This expedition never came around.